Subject: A plagiarism in plaid? I noted with interest that Liz Hunt's recent opinion piece — Immigrants have bags of ambition (June 2, 2007) — was a nice reworking of my April 13, 2007 essay, Bags and Stamps, published on my blog, Koranteng's Toli. While I appreciate that this means that I have readers in high places, the norm when remixing on the web is to include a link to the originating source of the material. I'll assume that this was a minor oversight on her part and, for what it's worth, she adds a little colour, her personal perspective and indeed some original reporting - not a bad remix - she certainly channeled my words and ideas quite effectively. Still one wonders about these things... A cursory examination reveals wholesale, shall we say, lifting of said words and ideas. 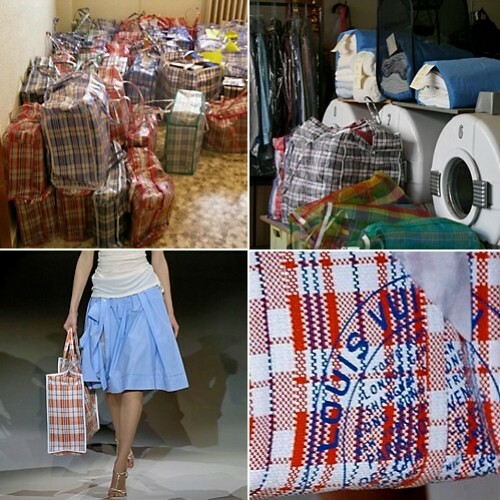 It is also ironic since the essay was ostensibly about the ecstasy of influence, as Jonathan Lethem would have it, and concerned itself with a high profile appropriation, if not plagiarism, by Marc Jacobs of Louis Vuitton fame of the notion of "Ghana must go bags" as used in the work of Ghanaian artist Senam Okudzeto. That the Ghanaian writer who connected these dots together is himself (inadvertently we'll assume) written out of the conversation is quite something to behold. 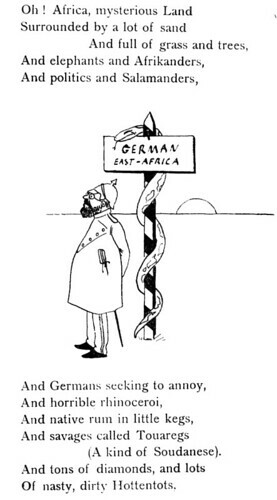 "Out of Africa always something new", wrote Pliny The Elder. There must have been a second part to his observation: "Things to be used but not acknowledged". A further twist, this essay is part of my ongoing Things Fall Apart series which I am hoping to publish as a book - I am quaint that way. It had been suggested to me to send it to the New Yorker or similar. It now appears that I have a nice postscript for the essay, if not a further essay topic, one addressing the lines between journalism and blogging and the influences and overlap thereof. I am unclear whether Liz's piece was published in the newspaper or only online. If the former, presumably there are well known procedures for corrections of editing errors, errors of omission or indeed (and God forbid) errors of commission - that is the domain of so-called intellectual property, copyrights and such. If the latter, I'd appreciate a link. The internet being what it is, I am glad to have the option of commenting directly on the piece in question through The Telegraph's website and 'having my say' in that forum. I'll demur for the moment and intend to publish my query on my website. Perhaps your response or indeed that of your reporter can occur on my grounds. Still, the currency of the web is the link, I don't think it is too much to ask for a link. It simply adds to the conversation. In Ghana and most of West Africa we call it the "Ghana must go" bag. 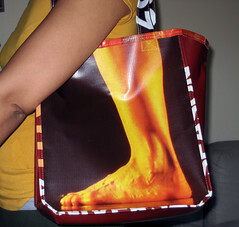 Last year Sokari Ekine revealed her own bag woman tendancies and opened the discussion - she's a connaisseur. In response, Georgia Popplewell noted that "in Trinidad I've heard those bags called Guyanese Samsonite". We learnt that in Germany, per contra, they are known as "Tuekenkoffer" or Turkish suitcase. In Boston I've heard them referenced as Chinatown totes, and called Bangladeshi bags in England, presumably after the 1970s influx of Bangladeshi immigrants. 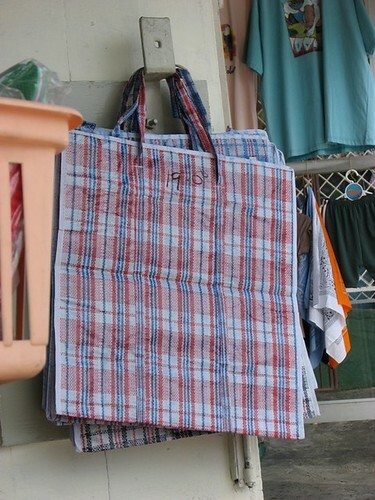 In Ghana, it is known as the "Ghana must go" bag; in Germany it is "Tuekenkoffer" or the Turkish suitcase; in America, the "Chinatown tote"; in Guyana as "Guyanese Samsonite" and elsewhere as the "Bangladeshi Bag"
Do note that the author completely misses Georgia's nuance by transposing Trinidad to Guyana. The point is that the naming is done by the natives - looking down onto the teeming masses of refugee or downtrodden immigrant Others. Thus Nigerians named the bags Ghana must go, Germans named it Türkenkoffer, and so forth. Thus this is not a simple copying and pasting, there was reordering and some conscious editing done in the article, and perhaps the immigrants coalesced into one indistinguishable mass. This is of a piece with the general disdain for said immigrants that the rest of the author's commentary indicates. We can also skip over how Boston becomes America in the coining of "Chinatown tote". The rest of the article I'll suggest is equally enlightening. I normally offer playlists to accompany my writing, in this case we'll go with Abbey Lincoln, she has been on my mind lately. From her extraordinary 1995 album A Turtle's Dream, the lyrics are inspirational and I hope she'll forgive me for reproducing them here with attribution. and keep your hand wide open. My inbox, the comments and clickstream on my website all tell an interesting tale. The global audience of modern travellers and sedate web surfers who frequent this joint have sprung into action, mice and keyboards at the ready. Even some who normally remain dark matter have sent head nods of recognition if not sympathy or empathy (and links of course - this is the web). It's comforting to know that I'm part of such a community. Sokari who started this global conversation is suitably outraged, as is Georgia, and presumably that prolific fellow named Anonymous. Sattva helpfully pointed out that even the typos were faithfully reproduced in the Daily Telegraph - the Türkenkoffer Tragedy as it were. The Telegraph columnist has no idea about the depth of fortitude of the interlocutors she dismissed - bags of ambition is the least of it. It's been a day or so since a Telegraph editor read my query and I, like many, have been slightly expectant as to their response. I know also of at least one outraged toli reader who deigned to comment on Sunday on the Telegraph's website - annoyed that I hadn't immediately published this note on my blog on Saturday. That comment has not been published and indeed, as I write, the article's web page is unchanged since Saturday. The initial silence from the Telegraph's offices, like all silences, can at once be seen as eloquent and troubling. Eloquent in suggesting that one's concern was deemed trivial or not worthy of a response and all that implies. Troubling because of what the cynical might proffer as the worst reading of the matter. If someone could be so reckless as to brazenly and casually pass off others' words as their own, one inevitably wonders just how long such things have been going on. We have seen recent high-profile examples of such effrontery in journalism. Such actions would also show a certain contempt, for editors and audience alike. As an editor, I would worry about the compromise of a publication's reputation and want to proceed carefully. Allegations of sloppiness and/or misconduct are serious, and reflect on people's careers and livelihoods, not to mention the bottom line of the organizations that relate to them. This is the tangled web of The Reporter and The Editors. I place my faith in The Editors in this instance. One theme I've been considering in this series is 'who is writing the script?' and I've even suggested a word to cover the behaviour I've observed: huhudious. I trust instead that Telegraph editors are simply not wanting to rush to judgement. Let's hope they will be thoughtful in their eventual and considered response. I do appreciate that The Reporter advanced the story - indeed she adds one important and original nugget: the name and background of the putative Chinese manufacturer of our Ghana must go bags. Another potential addition is the model name and price of the Louis Vuitton plaid appropriation - although that last could be figured out by following the links I sourced in my original essay. These are the kinds of things I would undoubtedly have followed up on as a professional. With The Reporter's kind permission, I will include these points (after quite scrupulous fact-checking of course, and with attribution) when I do finally submit my article to editors for publication in a magazine or book. It's a very creative defense, the most revealing phrase being "how our researcher came to your blog". Thus she cannot but acknowledge that I was a crucial source of her story - the damning spelling mistakes, let alone the juxtapositions that a few minutes revealed, don't offer a leg to stand on. A friend had posited an underling factor in this business, but who knows about these things; she can best inform us. Anyway you can judge her motivations and thought process for yourself. Her response is unedited as she requested. I do wonder about her use of the word "refute" and whether she has since taken a peek at my blog, because most wouldn't dare brazen this out. But maybe it is that in my culture I have a different appreciation of shame. Still I'll acknowledge the protestations of "good faith" - although the evidence is lacking in my opinion. I do believe in the golden rule but I'll admit I have no words for her. Rachel, ever succintly, weighs in on the matter, her global voice and journalistic viewpoint further clarifies the conversation. Fair and balanced. So. Twelve days later... As we continue to wait for The Daily Telegraph editors to weigh in on matters of plagiarism, I thought I'd lighten the mood a little and follow up with some of the visual responses I've received to the Bags and Stamps essay and to this note. The first came from Elia, whose visual sense is more acute than mine and came up with this great collage which makes the point more effectively than I had. My spanish is non-existent, but a Babelfish translation indicates that a very kind label had been launched towards this joint; a head nod back in your direction, Elia. Georgia, our Trinidadian informant on the "Guyanese Samsonite" business, took the following photo in a market in Scarborough, Tobago. She was also threatening to follow a lead and head out in the pouring rain to photograph a woman she had passed a day earlier, sans camera, who sported one of these bags that featured a flowery addition to our plaid stylings. Please don't risk your health on my account, it's just a bag! While on the Guyanese Samsonite angle, one wonders when that name was bestowed on the bags. I wonder if these are the same bags that not just the Guyanese, but also the Trinidadians and the Jamaicans, were carrying in the 1940s and 1950s when that immigration wave happened, and Britain was welcoming them for their cheap labour. 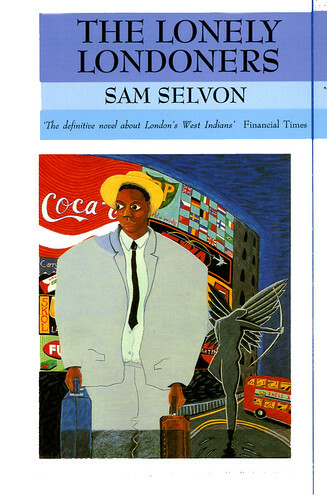 Their struggles were what the famed Trinidadian writer, Samuel Selvon, lovingly chronicled in The Lonely Londoners which also has piercing insights on African immigrants at that time. A old woman who look like she would dead any minute come out of a carriage, carrying a cardboard box and a paperbag. When she get out the train she stand up there on the platform as if she confuse. Then after she a young girl come, carrying a flourbag filled up with things. Then a young man wearing a widebrim hat and a jacket falling below the knees. Then a little boy and a little girl, then another old woman, tottering so much a guard had was to help she get out of the train. "Oh Jesus Christ," Tolroy say, "what is this at all?" "Tolroy," the first woman say, "you don't know your own mother?" "But what Tanty Bessy doing here, Ma? and Agnes and Lewis and the two children?" "All of we come, Tolroy," Ma say. The goodwill for those Caribbean immigrants was beginning to run out by the time he published his novel and he catches the flavour of that historical moment in the paperbags, flourbags and indeed in that stylized prose. Staying on the Caribbean theme, and with another stylist, one wonders whether our plaid bags were similarly depicted by Patrick Chamoiseau in the mythical slums of Martinique or whether his urban griot, Solibo Magnifique, would have spontaneously declaimed any odes to them as he walked through those grand markets. The cover art you'll see is again ambiguous. 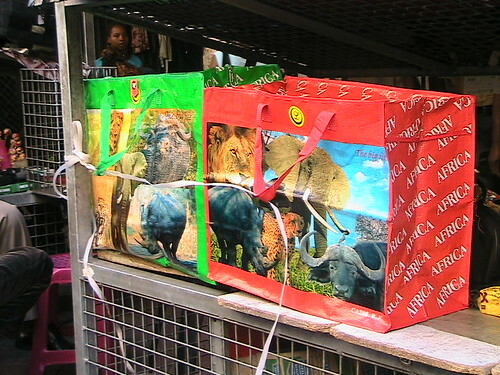 Sokari mentioned that the trend in South Africa was to rebrand the plaid bags "with shiny maps of Africa, elephants, soap powder and all sorts". The idea is to badge them with Made in South Africa labels. I quite agree, why should the Chinese have all the fun, and profit, even on these cheap goods? The Wife called this the Fubu effect, reinvention and appropriation. Sokari kindly sent along these photos that make the point quite effectively. Forget your garden-variety shoppers with heavy loads to pick up, I trust even the tourists will be picking them up, I certainly would. She adds: "photos were taken in April in the Jeppe Street / Bree street areas of downtown Joburg. I have a blue version of the red one which cost me 10 rands". They come in "blue, red and green and large, medium and small". A great knockoff with a little profit to boot. Still, as with book covers and types and faces, these too present a certain image of Africa: zebras, elephants, safaris etc. While certainly more colourful, fun and perhaps "authentically African", the more arresting images to my mind are those of the marketplaces in which they are found, and the context in which they are used. The streets of downtown Johannesburg and the activity therein draw me in, as do the marginalia of the Tobago concoction. 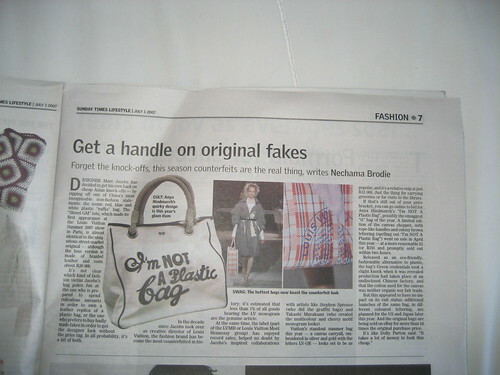 Those marketplaces are as much a part of Brand Africa or Brand Caribbean as the fashionable and camera-ready versions. Finally, and in a different direction, I ran across the work of Bay Area artist, Jenny Hurth, this past weekend at an art fair in Berkeley. 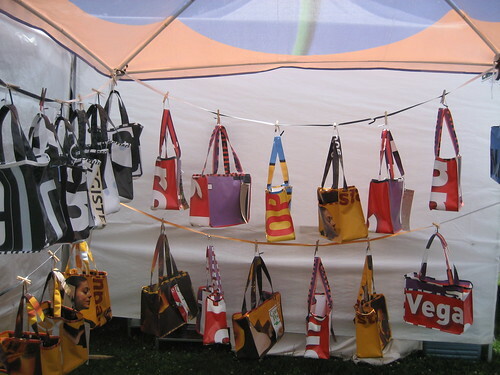 Another bag lady, she makes her bags from recycled banners from trade shows and conferences - essentially the garbage that these marketing events and ceremonies engender. I think the notion of recycling is quite apt, and works well in terms of encapsulating historical memory and rescuing it in a tangible, utilitarian, and, in some instances, fashionable repository. I'll try to connect her with Senam, they should have much to talk about. My good friend Nate, riffs on our "South African Street Merchant Bags" and considers containers in one big boxy multicoloured metaphor. 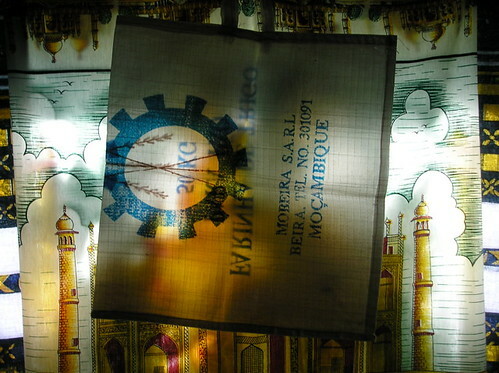 He also sends along a bag "bought in Vilankulos, Mozambique. 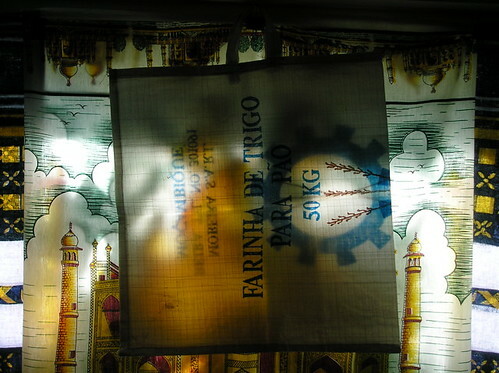 It's a re-sewn flour sack." Dig the back lighting. Reminds me of how flour companies in the US used to use sacks that had floral patterns printed on, once they realized farm wives were using the soft cotton material to sew dresses out of. I think Williams-Sonoma now sells "flour-sack" kitchen towels, designed to mimic the better properties of towels made from actual flour sacks. I too have batakaris from the north of Ghana made from flour sacks. They feel more comfortable than the ones made with more conventional materials and lining. As we have seen, their utility too goes beyond flour and general market duty, and spans the world, from Mozambique to Trinidad, to Ghana, England and Middle America. This reinvention is only fitting: Humanity knows no boudaries. Connecting dots further, I'll simply point to this image from a slideshow in Hanna Rose Shell and Vanessa Bertozi's wonderful documentary Secondhand (Pepe) about the history of used clothing and immigration - and more on said documentary later. 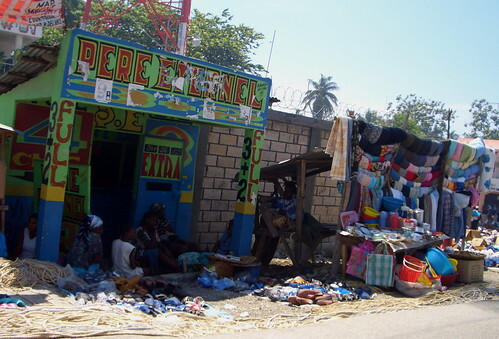 Simply note the presence of our Ghana must go bags in the midst of the bend down markets in Haiti where the cast-offs of the First World are bartered and reinvented in the comfort of the Haitian landscape. Perhaps others can provide their plagiarisms in plaid, I'll be your bag man, collecting your visions. I'm quite easy to contact and will happily link if need be — that business about attribution on the web... Links do cost so little. Nechama Brodie has written a sharp and insightful piece with a reflective perspective and original reporting. Further, she contributes a few more terms to our bag vocabulary. 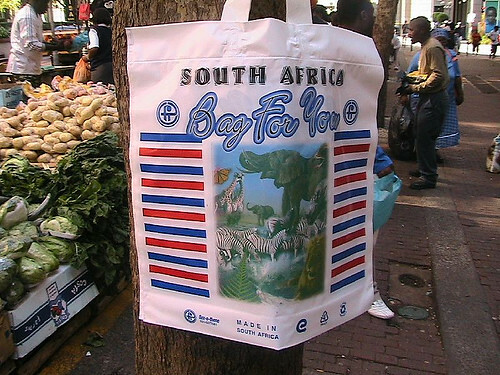 Apparently in South Africa, they are known as "raffia" bags or as the "Street GM" which meshes well with Nate's "South African Street Merchant Bags" characterization. Interestingly there is no trauma involved in the naming, these are generic names. One wonders whether the large influx of Zimbabwean immigrants fleeing the bleak desperation of that rogue called Mugabe in recent times will change that perception. From what I understand, South Africans are beginning to resent the refugees in their lands and, curiously enough, brand them generically as "Nigerians". Will be soon be hearing cries of "Nigeria must go" as the natives start resenting the immigrant upstarts? Or is it rather the case that Zimbabwean's, with their rich tradition of Ndebele textiles, have not had to resort to our bags of exigency as they flee into political and economic exile? Perhaps they use baskets as they take flight? Inquiring minds want to know. Grandiose Parlor points us to some videographic evidence, an AFP news report on Zimbabweans fleeing the brutality and economic deprivation that is the lot of those living under the thumb of that rogue. 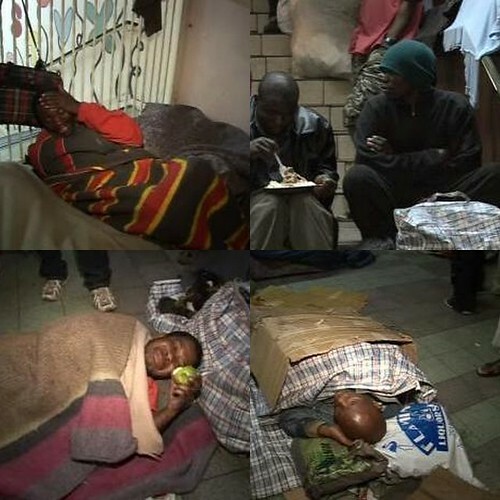 It is difficult to watch these kind of images and see proud people sleeping rough in churches in the cold South African winter. How does one handle the rogues that cause these things? 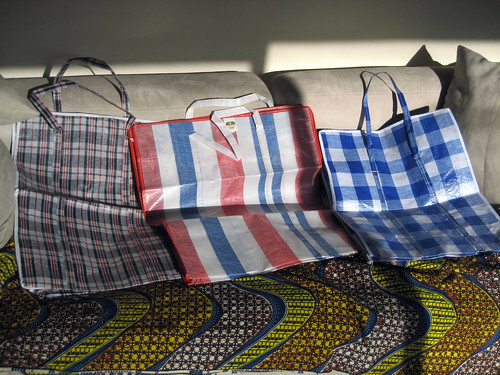 It is no comfort to notice the presence of our Ghana must go bags by acting as literal comforters for a few that choose a blanket of soul made of our plaid polypropylene bags. I'll wager we'll soon be hearing "Zimbabweans must go" (Zim must go?) before too long. Returning to lighter thoughts and perhaps to rogues previously discussed, I do like Brodie's poetic title. " Get a handle on original fakes" could very well be the best strategy to apply to our smug and admitted plagiarist at the Daily Telegraph. "I smoked, but it was for a good cause. And incidentally I resent you accusing me of smoking as much weed as I did smoke." Oh well hubris springs eternal, the celebrity got to her head; a diluted sense of noblesse oblige... We shall take our time formulating the appropriate response.